Audi announced the 2016 Audi Q7 at the International Auto Show in Detroit which has many state of the art connected car features, such as a new interface, head up display, phone connector box, ADAS, almost autonomous driving packages, new voice controls and 10 inch tablets for back seat passengers. The user interface has been streamline with haptic feedback. The driver can enter characters on the large touchpad or perform multi-finger gestures to zoom in on the map or scroll through lists. Functions can be accessed using a rotary push button and two rocker switches. There are new multifunction steering wheels buttons. Depending on the equipment installed, telephone and navigation functions can also be controlled via the steering wheel. Driver-relevant information is displayed in the new Q7 in a instrument cluster. The 7-inch color display places everything from the current radio station to the navigation map to the display from the optional night vision assistant directly in the field of view. The optional MMI navigation plus is also available with the Audi virtual cockpit, a 12.3-inch TFT display that presents tack-sharp, painstakingly rendered graphics. The new Q7 is equipped with the second generation of the modular infotainment platform (MIB) which includes a quad-core T30 processor from Audi’s partner NVIDIA for 3D graphics. Audi offers various levels of the infotainment modules for the new Q7. The MMI radio plus is standard in Germany. This offers interfaces for external devices such as mobile phones or memory cards. The high-end infotainment control center is the MMI navigation plus, which has an 8.3-inch monitor. Another upgrade is Bose sound system with 3D sound and the Bang & Olufsen Advanced Sound System with 3D sound fascinate even discerning hi-fi users. The Audi phone box, connects the cell phone to the car’s cellular phone antenna. Inductive charging and wireless smartphone connection will be available as additional functions shortly after the launch of the new Audi Q7. 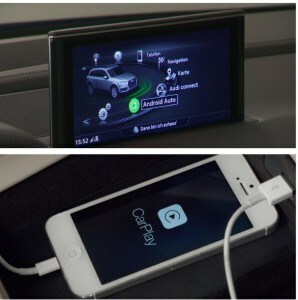 The Audi smartphone interface brings “Apple Car Play” and “Google Android Auto” on board. If an iOS or Android cellular phone is connected to the USB port (iOS from Version 7.1; Android from Version 5.0 Lollipop). Buyers have the optional choice of one or two Audi Android tablets with 10.1 inch screen, 32GB of storage, HD cameras, Bluetooth and NFCserve as rear seat monitors. The tablets are temperature-resistant and rugged for crash safety. The Audi tablets are connected to the MMI navigation plus via WiF with access to the radio, media, navigation and car functions of the Audi Q7. For those who are wondering why Germans love tablets in the back seat, it is because many Audi’s have chauffeurs or drivers. The rugged tablet may be strong enough for teenager or kids, too. MMI navigation plus also includes the module Audi connect, which connects the new Audi Q7 to the Internet via 4G LTE. Optional ADAS add-ons are bundled in the packages “Parking”, “City” and “Tour”. “Parking Package”– includes the surround view camera and park assist system, which steers the car backwards into parallel and perpendicular parking spots while the driver applies gas and brakes. “City Package” – with cross-traffic assist warns the driver of other vehicles when driving slowly in reverse.Trailer assistant for steering of trailers. Audi side assist measurements behind the car to ensure safe lane changes. Audi pre sense rear tensions the seat belts in the event of an impending collision from behind. “Tour Package” – is the precursor to autonomous driving with adaptive cruise control that keeps the Q7 at the desired distance from the vehicle ahead. It displays the distance when it is deactivated. ACC stop & go including traffic jam assistant, takes over the steering on developed highways if traffic congested and not moving faster than 65 km/h (40.4 mph). Audi active lane assist uses a camera and small steering interventions to help the driver to stay in a lane. Audi pre sense front warns of an impending rear-end collision with the vehicle ahead, tightens the belts and brakes the car autonomously. Also available as an option is the night vision assistant. The 2016 Audi Q7 should be available late 2016, pricing has not been announced, yet, Pricing expected to at least $50k or more depending upon the add-on packages which could range from $2,000 -$3,000 each.